In 1948, we (being Canada), approved a deal with the MPAA, with the dubious name of The Canadian Cooperation Project. Basically, we agreed to let the American studios distribute their films tax free, and in return, the American studios promised to occasionally shoot in Canada, and “promote” Canada by mentioning their friendly neighbours of the North in passing. If it sounds like a raw deal, it’s because it was – predictably, there was no measurable tourism boom just because a main character had an Aunt from Vancouver, some visiting relatives from Regina, or that there was a bit part for a brave Mountie or French Canadian lumberjack. Characters dreamed of settling on ranches up in Alberta, or – my personal favorite – the villians escaped to Canada. Incidentally, if anything was going to foster tourism, it would be the beautiful documentaries the NFB was making at the time, and all the Canadian Cooperation Project did was hinder the growth of the Canadian feature film industry and, no doubt, turn it into the uphill battle it is today. I couldn’t help but think of that, the ‘what happens after the bad guys get to Canada?’ question, while watching the wonderful noir-tinged play HELEN LAWRENCE at the Arts Club. 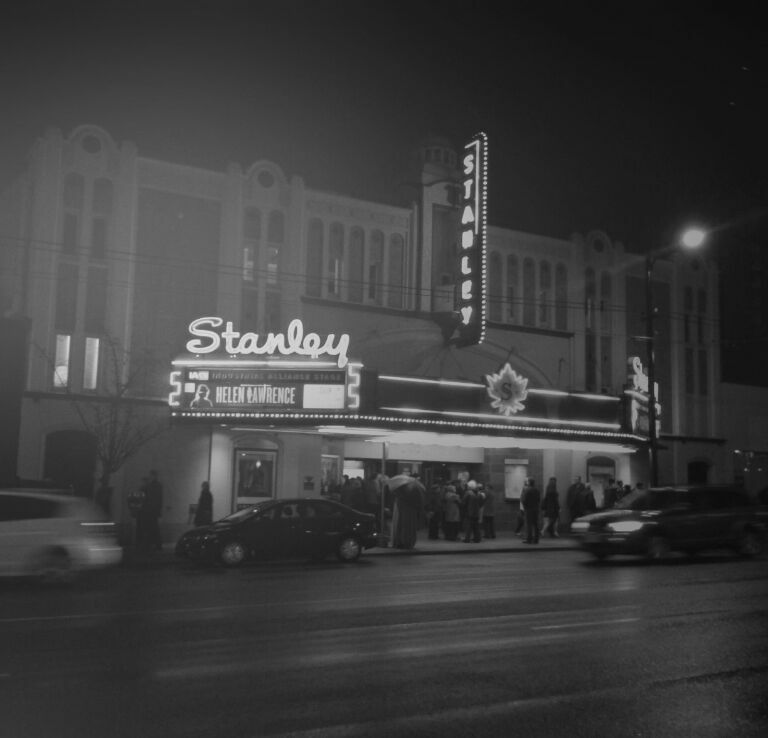 I’ve been looking forward to it since it was announced – not only is it the debut of the first play co-created by visual artist Stan Douglas and writer Chris Haddock (Intelligence, Boardwalk Empire), not only is it set in Vancouver in 1948, but it isn’t just a play – it’s a multimedia experience. The actors perform the play’s action behind a skrim on a three-walled blue screen stage, with minimal props and sets. The actors are simultaneously being filmed and the action is projected in black and white on the screen, which now shows digitally created sets of long-gone historic locations, the Old Vancouver Hotel and Hogan’s Alley (now the Georgia Viaduct – so when you’re caught in traffic, know that it once was vice-central, the home of gambling and prostitution). The titular character, Helen Lawrence is after the man who wronged her back in L.A. – some nasty business with a ladies hatpin, a rich husband, and a “heart attack.” She ends up in the Vancouver of 1948, a turbulent period of police corruption, changing landscapes, and hard-luck types just trying to get by. Particularly compelling is the relationship between two brothers – one a major player in the business of Hogan’s Alley, the other, back from the war and dealing with a what seems to a be widespread sense of displacement. I really won’t give away too much, best to see it yourself. To say Helen Lawrence is ambitious is an understatement, and I doubt it would have come across so well if it weren’t for the careful staging and seamless integration between live action and digital sets, the filmic dialogue, and the caliber of the acting. Each of the actors (who split their time between stage and screen) have managed to nail the delicate balance between a performance that is fit for the stage but made for the screen. Occasionally Helen Lawrence is the victim of its own technical and thematic grandiosity; the multiple plot lines aren’t fully realized in the lean 95 minute running time, so we’re left with a collection of well-rendered, well-acted, and well-shot scenes of characters in what could be a much larger story. The novelty of the staging is ultimately a great success – Helen Lawrence is at its best when the action onscreen and onstage are at odds with each other – a close up on a character’s face during a fight, or three characters, in separate locations on the stage, preparing for a showdown. There was a minor technical difficulty the evening I saw it (second night – will likely be ironed out soon!) – a slight delay in the sound onscreen, which caused a rather jarring echo. Despite this, I’d be surprised if there was anything more vital and relentlessly innovative on Canadian stages this year. Helen Lawrence is at the Arts Club until April 13, 2014, and then will be touring. And P.S. At Large is a new category that I’ve been meaning to set up since the beginning of this blog’s short life – wherein I will write about local events of a vintage, historical, or noir flavour. Could be anything from big screen showings, tours, historical buildings, and the local bar where you’re most likely to meet someone who’ll compromise your morals and leave you for dead. The usual.